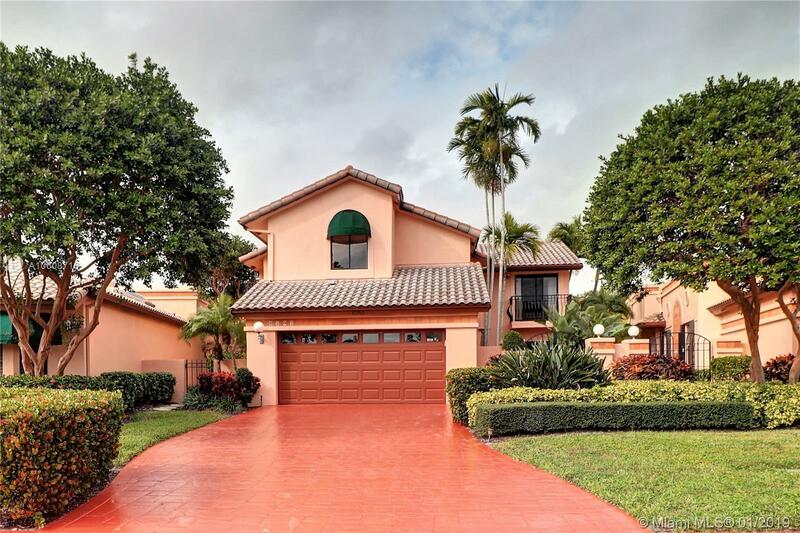 Absolutely outstanding 5/3 pool home in beautiful gated neighborhood in Villa Flora of Prestigious Boca Pointe located in the heart of Boca Raton. Largest home with newer hurricane gated garage door on oversized lot. Double door entrance to foyer, vaulted ceilings, very spacious living area & formal dining, large den and bedroom with walk-in and full bath. Oversized eat-in kitchen, picturesque window to outdoor atrium. Sliding doors lead to your tropical paradise. Landscape watering comes from the lake; huge pool, separate large Spa on totally private patio. 2nd level, large master suite w/balcony, walk-in closet, separate shower, bath, double sinks & atrium views. Small loft area, laundry room, 3 other bedrooms and 2nd bathroom. Great for entertaining. Directions: SW 18th Waterfall Gate Into Villa Flora Then Left Around Bend.